Can you name the systems that run your office? If you made a list, it would likely include your phones, calculators, copiers, fax machines and more. But you’ll also probably find batteries, cameras and shredders on the list. 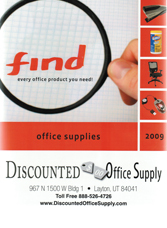 Discounted Office Supply.com has all of that equipment-from phone systems to dictation equipment, and more. We offer our equipment and services to businesses throughout the continental United States through our 36 geographically located distribution centers. No matter if you’re buying phones or printwheels, you’ll find our prices, selection and service second to none. Browse our categories below and order today.